Home » Cheap and Good? 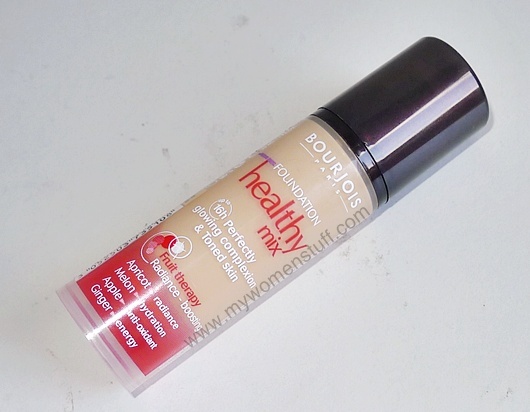 » Bourjois Healthy Mix Foundation : Its good, get it, ’nuff said! Bourjois Healthy Mix Foundation : Its good, get it, ’nuff said! If we had Bourjois here in Malaysia, I’d tell you to stop reading this right about now and head out there and get your very own Bourjois Healthy Mix Foundation! Yes, its that good and I like it that much! The Healthy Mix foundation was introduced early in 2010 but as Bourjois isn’t a brand we get here, I tend to not pay attention to it. Still, when confronted with a counter in Superdrug, I just had to pick something up. And this was one of the “somethings”. My colour is No. 51 Light Vanilla which is my shade to a T. The product comes in a slim plastic bottle as you see in the picture, with a pump nozzle. 1 pump is about all I need for my whole face. The texture is medium-sheer but buildable. Doesn’t go much further than medium coverage though if you prefer something full coverage. Like all Bourjois products, there is a strong scent. This one smells of fruits, which is really quite strange. Not strange when you consider that they have enriched it with fruit ingredients. As you can see from the label, its Apricot (radiance), Melon (hydration), Apple (anti-oxidant) and Ginger (energy). The scent is mostly that of Apricot/Melon. It does dissipate, but only after quite a while but on the hands, it can linger. This foundation does not clog my pores, does not accentuate pores, gives a nice glow to the skin and does not look cakey, thick nor artificial on the skin. It is about as good as or even better than any high end foundation in the market and this is probably what I wanted Teint Miracle to be like, which that wasn’t. Chanel and Bourjois are sister companies! You must admit the Bourjois little round pots of blush and Chanel Joues Contraste blushes bear an uncanny similarity. Bourjois has been around since 1824! PREVIOUS POST: Eyeko Cherry Fat Balm : Who are you calling Fat then? argh! if only we had this in msia right? i am still still surveying on different foundie. Yup! Bourjois doesn’t seem to be coming in yet. Hopefully soon although their products are all a bit hit and miss 😛 Have you tried the Clarins one? See if you can get yourself a sample. Got me tempted again. No good! I’m also tempted by the Bourjois Organic Bio Detox Foundation S$35.50. Saw it in the Watson magazine “Glow” recently. Lucky you then! 😉 You’re welcome! But I didn’t get it. I have too many foundies to start with. Both the Revlon liquid ones, an Everyday Minerals Matte, a BB cream, and the Maybelline Angelfit. YIKES! Saw this in Sg and didn’t think of getting it. Now readin this got me all squirmy and regretful.Ooooooooooo! i have this and have been using it for the past 2 months! its a huge love seeing that i never liked liquid foundation before and have always stucked to powder ones. but this foundation gave me wonderful glowy skin that doesnt look oily even after hours of wear. holds up well with singapore’s dreadfully humid weather too. Yay for another fan! Its really good and as you said, stands up to our tropical humidity which is awesome! I have the same one, and I really like it – in fact, I would love it, if only they had made a lighter shade. I know, #51 is pretty light already considering many drugstores brands consider a muddy yellow-beige “vanilla” or “ivory”, which it totally isn’t, but I do feel this is just a tiny tad too dark for me. 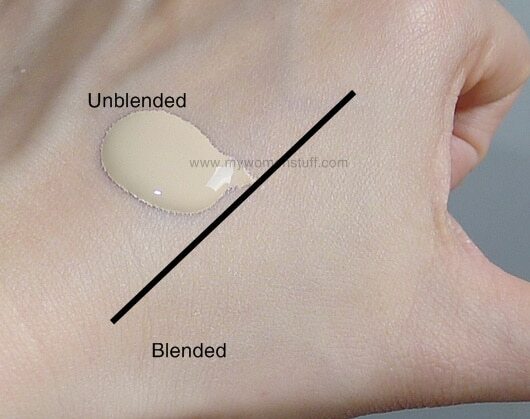 Oh you are so right about drugstore foundation colours! Towards the light end of the spectrum its always this really weird shade that’s either too cream or too white. So sorry to hear you couldn’t find a colour match. Those with very dark skin will also have a problem I think. Here in Germany, being white is not really popular, so I guess no one wants to sell light foundations as people like to tan anyway. Companies like Maybelline take their lightest shade from the German releases even. Stupid tanning frenzy. Coincidentally I was wearing this foundie today. I loved this foundie to bits especially its smooth texture and refereshing scent whenever I use it. I bought both this and the organic one during my trip to S’pore. Sadly, the organic foundie doesn’t suit me well with its colour and my complexion looked muddy yellow and dull. It also dried up fast on my face during application which was quite a hassle to use. It ended up in the bin after a few uses. Glad you bought this. Oh I’m glad I bought this one too, now I read what happened to the organic one. Glad we both agree this is an awesome foundation! found it in Vietnam, but didn’t get it as it was too light! wish they made darker shades. gosh i regretted not getting it! i saw it at the bourjois counter few days ago and immediately i recalled that you got it during your UK trip but i thought i would give it a miss! will get it the next time i pop by again! thanks for the review PB! The foundation is lovely and moist but one thing is that it settles into the lines under my eyes 🙁 and it needs a dusting of some good setting powder to make sure it doesn’t transfer, but what happens is that the powder takes away a bit of its beautiful lucent sort of glow. I do dust some light loose powder over it too but it doesn’t kill the glow, thank goodness 🙂 I must agree that #51 which I think is the lightest shade isn’t quite light enough for the very pale. Perhaps it just suits Caucasian colouring better? But I’ve read of complaints from them too. This is a super super foundation!. I’ve been using this for a couple of months now since September and am totally in love with it. Bought this after reading Jojoba (of my makeupreviews). It really does leave your skin looking almost flawless. Recently got the 10 hour sleep effect one. Coverage wise and finish is different…10 hour sleep is more light coverage with a dewy finish. Completely bummed that they don’t have this in Malaysia, as i will be leaving Ireland for good next week. Gonna get hubby to stock up for me before he returns home this July, hehe! Glad u liked it!